With Apple's iPhone 6 and iPhone 6 Plus seeing wide release later this week, the company on Tuesday published a reference guide aimed at helping Android device owners migrate content to the new handsets. 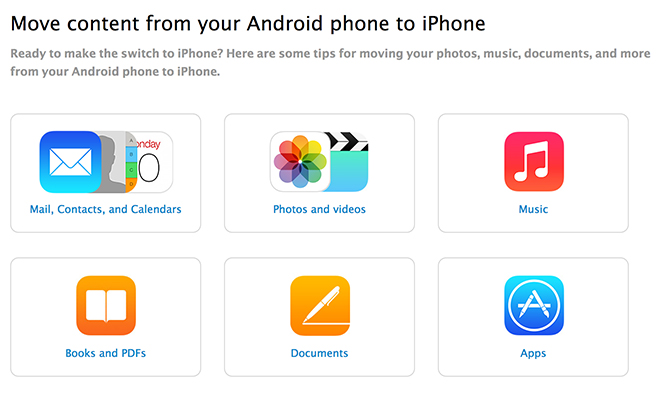 Posted to Apple's Support Documents sub-site, the new page, titled "Move content from your Android phone to iPhone," takes current users of Google's mobile operating system through the steps necessary to move content like Mail, Contacts, Calendars, Photos and Documents over to iOS 8. Ready to make the switch to iPhone? Here are some tips for moving your photos, music, documents, and more from your Android phone to iPhone. Apple tells Android users that Mail, Contacts and Calendar data can be transferred over to a new iPhone by simply adding a new email account to the Mail app or importing content from a social media network. Alternatively, third-party apps like Copy My Data or AT&T Mobile Transfer move over data automatically instead of manually typing in contacts, calendar events and addresses. Third-party apps are also mentioned as a quick transport system for user photos, though Apple offers a more comprehensive walkthrough for importing images as data files using the Android File Transfer tool and iTunes. The same method is suggested for transporting music, books and PDF documents. As for apps, Apple says, "You'll probably find the apps you're already using on the App Store. Go to the App Store, search for the apps you have now, and install them. Then sign in with your user name and password." Along with the usual iPhone user base, Apple's new handset models are expected to capture a portion of Android owners attracted to the larger 4.7-inch and 5.5-inch screen sizes. Seemingly supporting the theory is a report from last week that noted trade-in requests for Samsung smartphones surged after the iPhone 6 announcement.